FirstEnergy Stadium will welcome the 12th Annual Eastern PA Toy Run presented by Classic Harley-Davidson on Sunday, November 4th from 11:00 a.m. to 2:00 p.m. in the Tompkins VIST Bank Plaza at FirstEnergy Stadium. 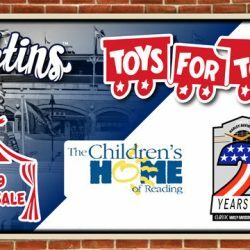 Proceeds from the event will benefit the United States Marine Corps Reserve Toys for Tots Program and The Children’s Home of Reading. Folks will be admitted to the holiday event by presenting a new, unwrapped toy of any value or by making a monetary donation that will be used to purchase additional toys for children. Motorcycle registration for the toy run will begin at 9:00 a.m. at Classic Harley-Davidson. Santa Claus will lead the ride as it departs from Classic Harley-Davidson on Route 183 at 11:00 a.m. and follows a 25-mile course until arriving at America’s Classic Ballpark for an estimated noon arrival. All motorcycles, Jeeps, and classic cars are welcome to participate in the Eastern PA Toy Run with a donation of an unwrapped toy or game. Upon his arrival at noon, Santa will be on hand until 2:00 p.m. for photos with those on both the naughty and the nice list. There will be a Fightins Season Ticket Holder Party at the pool from 11:00 a.m. until 1:00 p.m. The Eastern PA Toy Run began in 2007 after the Berks County Toys for Tots motorcycle run was potentially cancelled after the Marine Corps Reserve Unit was deployed. Multiple motorcycle runs combined and teamed with the Fightin Phils in order to continue benefiting Toys for Tots in Berks and Lebanon County and The Children’s Home of Reading. The Fightin Phils Annual Merchandise Tent Sale will take place from 11:00 a.m. until 2:00 p.m. in the batting tunnel. All merchandise will be available for purchase. There will be huge discounts up to 50% off for unique items such as game worn uniforms and one-of-a-kind signs and batters! Fans can own a piece of FirstEnergy Stadium history!